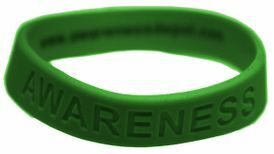 Our Green "Awareness" Bracelet for Organ Donation Awareness is debossed with the word "AWARENESS" on it. Standard 8" adult size. For orders over 100, call for special prices. 100 % lead free. Debossed means that it is similar to being engraved - the words are sunk down into the bracelet for a long lasting look.